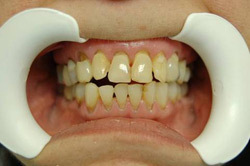 Sometimes the damage to your teeth is so severe that a single restorative treatment is not sufficient to allow for you to chew properly or to improve the appearance of your smile. Miami’s Dr. Andres de Cardenas and his staff of caring, concerned professionals want you to know when you walk into their office you’re not just seen as a patient, but respected as an individual. That respect means you’re given all your options when it comes to restoring the appearance and function of your mouth. 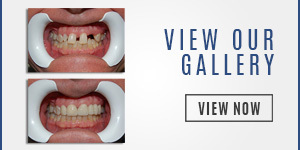 One of the most comprehensive restorative treatments available is a full mouth reconstruction. 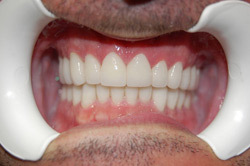 Full mouth reconstruction, in general terms, is the process of simultaneously rebuilding or restoring all of the teeth in the upper and lower jaw using crowns, bridges, implants or some combination of these to restore the full and natural function of the mouth. 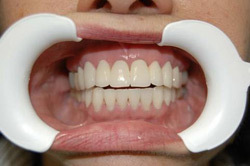 The overall goal of a full mouth reconstruction is to create the correct relationship between the jaws, muscles, gums, bones, teeth and to optimize the aesthetics, as well as the function, of the mouth. 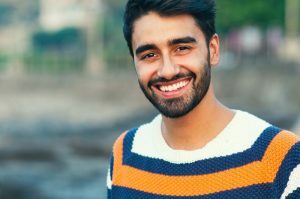 Before performing any full mouth reconstruction, Dr. de Cardenas, from his Miami office, performs a complete examination of your teeth, gums, joints, jaw muscles, occlusion, and the aesthetics of your teeth in relation to the mouth and rest of your face. This exams includes taking x-rays. 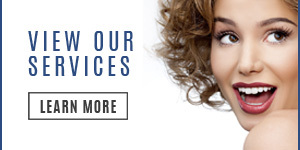 Once Dr. de Cardenas compiles a complete case record, in consultation with you, Dr. de Cardenas develops a step-by-step treatment plan for your full mouth reconstruction. Since each treatment plan is developed on each individual’s precise condition, the number of visits required for a full mouth reconstruction is specific to the individual case. Patients who have had Dr. de Cardenas’ full mouth reconstruction report an improved smile, pain-free chewing, diminution in jaw and neck related pain and better overall oral health. 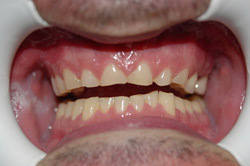 Full mouth reconstruction is a comprehensive procedure requiring a great deal of care and consideration. That’s why Dr. Andres de Cardenas asks that you contact him to schedule a consultation to see whether a full mouth reconstruction is the correct procedure for you. You can contact us using our convenient email form and we’ll get right back to you, or simply call us at (305) 251.3334. 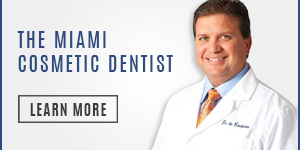 Talk to Dr. de Cardenas about the benefits of a Full Mouth Reconstruction in Miami. When you come in and speak with Dr. de Cardenas you’ll experience the difference between being treated as a patient, and being a treated as a part of the family.